Martin Manning on Is science censored? Jack Auty on Is science censored? Stephen Thorpe on Is science censored? Geoff Willmott on Is science censored? Peter Griffin on Is science censored? More than half the world was intellectually disabled prior to 1917CE….. if you extrapolate the Flynn effect. This blog will be an interesting dive into IQ, intellectual disability, crime, time travel and the Flynn effect. Let’s start by saying that you are probably “smarter” (whatever that means) than your parents. That’s right, when you were a pimply, hormone filled, teenager and you thought your parents were morons you might have actually been right. Well not morons, but maybe 6 to 9 IQ points lower than you. Einstein 100 years ago predicted gravitational waves which were discovered in 2016. Kim Kardashian “I rented my mom a monkey for the week because she had a syndrome where she missed children in the house.”. And that’s why anecdotal evidence is a waste of time. 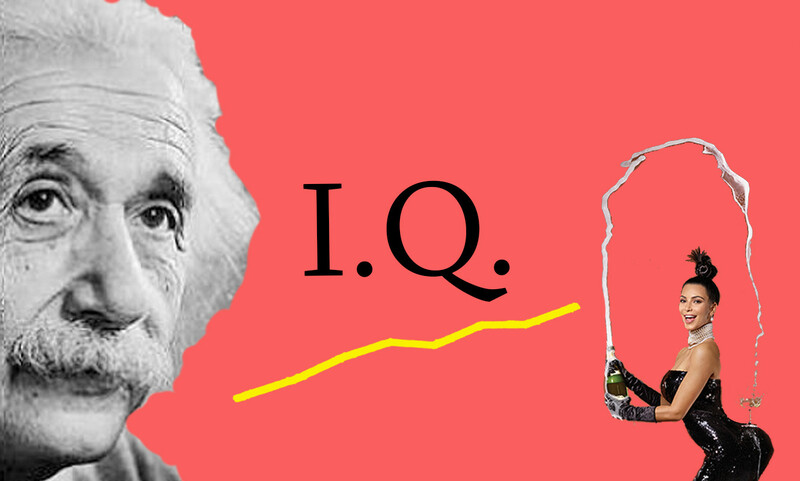 Let’s start at the beginning, IQ (intelligent quotient) is a scaled score given to people who have undergone one of the many variations of an IQ examination and is a way of quantifying intelligence. This score is (normally) scaled such that the median is 100 and the standard deviation is 15. By scaling this score it allows us to very easily calculated what proportion of the population you are smarter than based on simple normal distribution statistics. For example if you score 100 you are smarter than approximately 50% of the population, a score of 115 (1 standard deviation from the median) means you beat out 84.1% of the population, 130 and you can rule over the bottom 97.9% of the population and can join the MENSA group, if you score 145 you are more intelligent than 99.9% of the population and join the ominously named Triple 9 society (who apparently weren’t smart enough to think of a better name). Unfortunately, if there are winners, there must be… not winners. IQ is also used to identify intellectual disability and this is normally set at 2 standard deviations below the median at an IQ of less than or equal to 70. In this respect intellectual disability is the MENSA of below average intelligence. Efforts to ascertain how someone gets a good IQ have been thorough and largely fruitless. No single strong genetic or early life factors have been identified, and no interventions have been found robustly effective. The massively expensive Head Start Programme in the USA, which provides comprehensive early childhood education, health, nutrition, and parent involvement services to low-income children and their families, failed to cause a lasting effect on IQ. Largely, IQ seems to be out of your’s or your parent’s control. Now obviously genetics plays some role, but large genome wide association studies looking at 2.5 million locations in the genome in ~7,000 people have found that genetic variation only explains about 35% of the variation in IQ (Kirkpatrick et al. 2014). Interestingly, these studies found that the genome locations with the biggest effect sizes on IQ didn’t code for a protein, i.e., late 90’s scientists would have considered these bits of DNA as “junk”. So if big interventions in your environment like the Head Start Programme don’t affect your IQ and gene’s only explain some of IQ what the heck makes your smart? Well it is probably a complex mix of genetic, epigentic and environmental factors that interact and interweave in such a way that it is basically unpredictable, like the weather (fig. 1. ). What this means is that your IQ is your IQ, there isn’t a lot you can do about it, so don’t judge people for things that they have little control over. Fig 1. 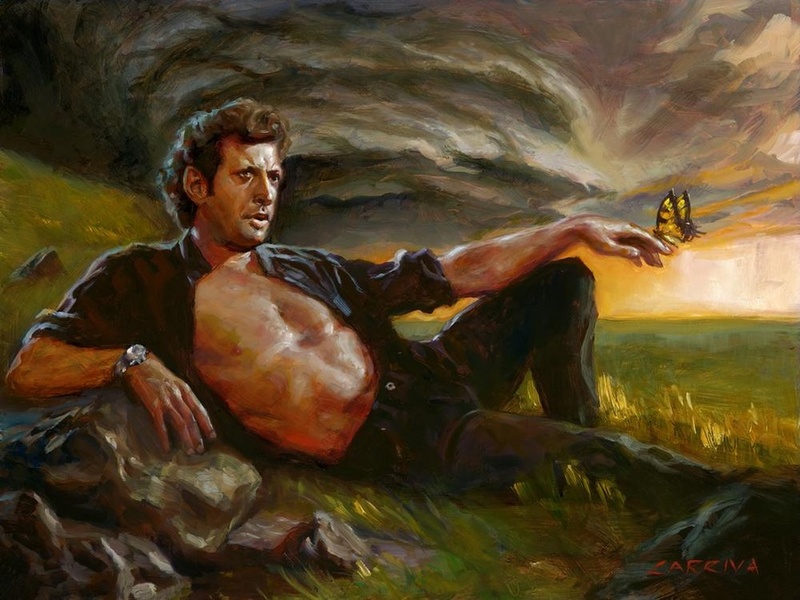 A pictorial representation of Chaos theory– Ian Malcolm: From Chaos by John Larriva. Now back to the early 20th century morons. Notice that IQ is scaled. What this means is that every year or so the scores on the test are averaged, and then adjusted such that the median is 100 and the standard deviation is 15. Because of this we missed something big in the data for decades- we are getting smarter. We couldn’t see it because the median was 100 every year, but that is because we made it that way. If we hadn’t scaled it we would see a rise in IQ of around about 3 points every 10 years (Trahan et al. 2014). This rise in IQ is a well studied phenomenon and is known as the Flynn effect, named after New Zealand’s very own Prof. James Robert Flynn. 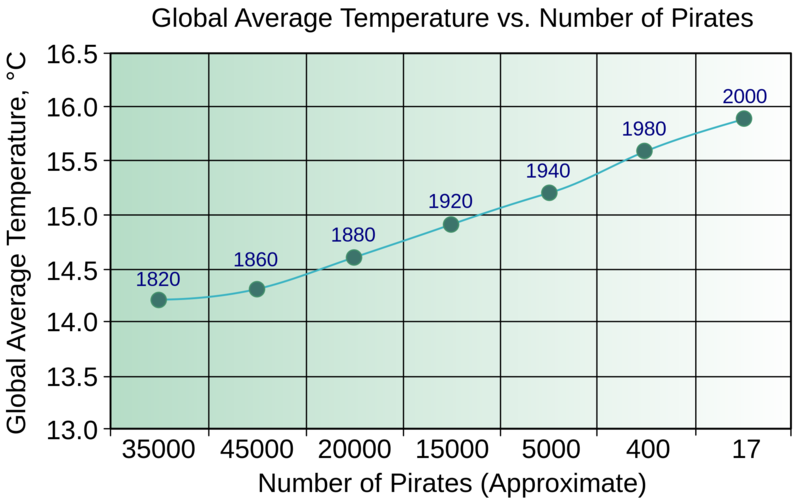 This means 100 years ago the average IQ would be the equivalent of 70 today (if the trend holds true). Meaning half of the population in 1917 would be defined as intellectually disabled if they were DeLoreaned to today. This drift in IQ has interesting ramifications. For example if you score 130 today you would be let into MENSA, but then in 10 years time you would perform relatively worse on the test and be forced out of the club (fig 2.). Fig 2. Who rigs every Oscar night? Being part of MENSA may be a trivial issue, but this drift upwards in intellectual standards may have very important implications in criminal cases. A person may be initially found to have sufficient IQ to understand right from wrong, be convicted of murder and sentenced to death. However, while on death row their relative IQ relative to the adult population would be decreasing as new and smarter generations enter adulthood. They may then have their IQ tested again just before being committed to death and found to have an IQ too low to consider a functioning adult that has a complete understanding of right from wrong. It has been argued that this legal threshold should be set at intellectual disability (IQ<70). Whether this person should be judged based on the IQ at the time of the crime or the time of the punishment is still argued over in legal circles. My two cents are that this IQ-death row hypothetical situation merely highlights the arbitrary nature of the legal definition of competent and perhaps the lack of utility IQ provides in a legal (or perhaps any) context. Why the Flynn effect occurs is still hotly debated. Some say genetics, claiming that in the last 100 years we have mixed our genes more than ever, creating individuals with a greater diversity of alleles, AKA the heterozygous advantage (Mingroni 2007). Basically this means we are less inbred than we used to be. Others say pre and post natal nutrition has improved (Lynn 2009). Noting that with the invention of the freezer and transporting food, our diets are more nutritionally complete now compared to when we started testing IQ 100+ years ago. To support this they point out that height has seen similar increases to IQ over the same period, and that there is a correlation that demonstrates that taller people are smarter (Taki et al. 2012). Others say that we are having less siblings, allowing more parental care (Sundet et al. 2008). Or perhaps we are drinking less alcohol and smoking less during pregnancy (Lewis et al. 2012, Dobson 2005). Or is it because we are better at testing due to significantly more testing in schools or just education in general? As you might have guessed, we don’t know. Again it is likely a culmination of many factors. I know that sounds like a cop-out answer, but that is the truth. In fact I would argue that in biological and social sciences there is a correlation between the simplicity of an idea and the likelihood of it being incorrect (which is why you shouldn’t read any book by Malcolm Gladwell). The complexity of causes for the Flynn effect nicely demonstrates a problem with any trends over time, because so many things are changing over time, it is impossible to draw simple conclusions of cause and effect. For example there has been a steady decrease in car deaths over time, the car industry would claim that it is because cars are safer (air bags, ABS brakes etc. ), the government might argue the advertisement campaigns on safer driving are working, the police might argue that all those speeding tickets are sending a clear message and my mate Prof. Flynn might argue that it is because we are smarter now than we used to be. The point is that societal influences are complex and ever changing, so trying to point out a simple X is causing Y is very difficult and nearly impossible if the time-span you are looking at is 100 years. Unless it is an obvious effect like the decline in pirate numbers is causing global warming (fig. 3.). May his noodly appendage guide you. Fig. 3. Clear evidence that as pirate numbers decrease the global temperature increases. The proposed mechanism is that pirates are unarguably cool and, therefore, cool the planet. Eric Crampton on Is science censored?